The indicator is defined as the share of persons aged 25-64 with tertiary educational attainment on the overall population aged 25-64. Education is one of the key policy fields in Europe. Tertiary educational attainment is one of the headline indicators of the EU2020 Strategy “Smart Growth” with the objective of at least 40% of people aged 30-34 years should complete third level education by 2020. This indicator measures the highly-qualified labor force as basis for current and future R&D activities in Europe, and as basis for high-qualified jobs. In 2012 there is still a rather large divide in the level of tertiary education in the BSR, urban areas are no exception to this. In the BSR only the Polish cities have shares lower than 20% while in many larger cities like Vilnius, Tallinn, Copenhagen, Helsinki, Oslo and Stockholm tertiary education rates are between 46-85%. There is a general variation in levels among cities in a country (as in Sweden, Denmark, Latvia, Lithuania and Germany) but Finland is somewhat of an exception to this. 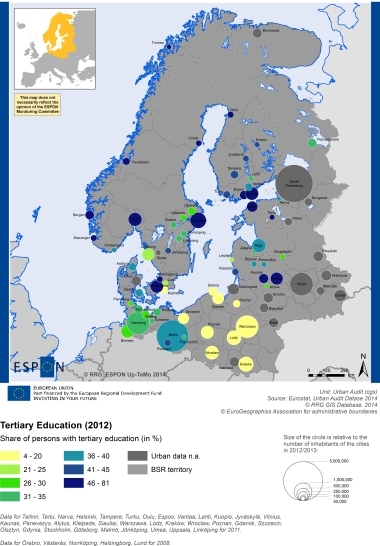 In Finland and Norway many cities place themselves in the highest category indicating a high level of education across different sizes of urban areas. In Germany there is a clustering of higher level of education in the south-east cities, while the north-west cities show lower levels.